That’s a final. @WinnipegWild defeat Cougars 1-0 and win series 3-0. After the first week of cold weather and not being able to make it to practice during the week the Cougars pulled off a couple of wins on the weekend. Friday night the Cats were sluggish out of the gate but hung around and knocked off the Norman Northstars 5-3. Bryce Young potted a couple of goals with singles going to Carson Boyechko, Caley Barscello and Jared McCorrister who dressed as an AP. Riley Wallace turned aside 28 shots for the win. 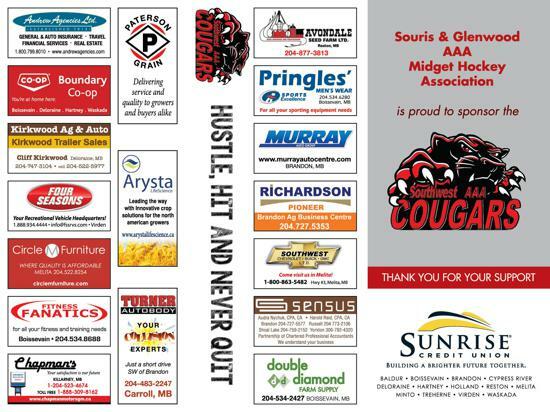 Saturday night the Kenora Thistles came to Souris 2 points behind the Cougars in the standings. The Cougars, as a team moved the puck and shot the puck resulting in a 5-0 win over the Thistles. Randy Cooke earned the shutout with 26 saves. Josh Wiens scored in the first, Dylan Fontaine, and McCullough Park found the net, but the big winner on the night was Carson Brigden, who potted his first 2 goals of the season. The Cougars finish the pre Christmas part of the schedule with the Winnipeg Thrashers Saturday night in Souris, and then face the Brandon Wheat Kings Sunday afternoon. The final game before Christmas will see the Pembina Valley Hawks visit the Cougars in Deloraine. The Cougars will be celebrating 30 years of hockey on the 21st as the Cougars first hit the ice 30 years ago in Deloraine. A pair of weekend wins moved the Cougars 3 games over 500 with a 10-7 record. The Cougars knocked off the second place Yellowhead Chiefs 2-1 Friday night in Shoal Lake as Tanner Andrew potted the winner from Callum Fortin and Jay Webber with 15 seconds left in the game. McCullough Park scored a power play goal midway through the second period with Dylan Fontaine and Carson Boyecko picking up the assists. Riley Wallace turned aside 45 shots for the win. After the big win in Shoal Lake the Cougars played host to the Winnipeg Wild on Saturday night. The Wild came into the weekend with one loss and looked to run over the Cougars. The Cougars never trailed in the contest as Caley Barsello opened the scoring in the second. Kyle Bettens evened the score eight minutes into the third, but goals by Tanner Andrew and Callum Fortin with the eventual game winner at the 12 minute mark was all the Cougars needed. The win was the Cougars third in a row. The Cougars play host to Kenora on Friday and then take on the Pembina Valley Hawks in a sixth place showdown next Sunday afternoon in Morden. The Southwest Cougars split a pair of weekend games, remaining in sixth place in the Manitoba Midget AAA standings but shocking the third-place Winnipeg Thrashers along the way. Saturday, the Southwest squad travelled to Beausejour for a sixth-place showdown with the Eastman Selects. The Cougars had won the first two matches this season and looked to make it three in a row. The teams were tied 2-2 early in the second period but the Selects broke it loose with three unanswered goals to finish the second and escaped with a 5-2 win to move 4 points up on Southwest. The Cougars turned it around Sunday, eking out a 5-4 win over the third place Thrashers in Winnipeg. Southwest had one goal leads after both the first and second periods but Caley Barscello’s goal with just over a minute left in the game proved to be the winner. Randy Cooke had a big afternoon in the Cougar net, making 45 saves for the win. The Southwest Cougars split a pair of weekend games but dropped a notch lower in Manitoba AAA Midget league standings. Friday night, Southwest fell 2-0 to the Winnipeg Wild in Portage. Riley Wallace turned aside 36 shots for the Cougars but the second frame proved the team’s undoing. The Wild scored a power play goal seven minutes into the second and again with 28 seconds left in the period, sealing the win. Saturday afternoon the Cougars again tangled in Portage, rolling to a convincing 6-2 win over Norman. Six different players tallied for the Cougars, who opened the scoring in the first and took a 5-1 lead into the dressing room after two. Randy Cooke turned aside 28 shots for the win. The Cougars improved to 5 wins and 3 losses for the season. They entered the weekend tied for fourth in the MMHL but slipped to a fifth place tie with Pembina Valley and Eastman. The Cougars host the Interlake Lightning Saturday Oct 15 at 8PM. The teams played into overtime in week 1 with the Cougars earning a 4-3 overtime win. The Cougars fell to 8th place on Wednesday night when Parkland and Kenora both won moving 2 points up in the standings. Saturday the Lightning will be looking to get back in the win column aa they sport a 1-3 record in the early going. The Cougars will have NHL drafts available tonight and is attached to the website as well. With all the great hockey minds in Southwestern Manitoba you can pick a team for $10 with a chance of winning $400. The proceeds of the draft go into the Cougars travel fund which consumes almost $40000 of the teams budget. The drafts are available from any of the players or parents. The Cougars have started selling a third square board. Each square is $25. With a chance to win $50 at each home game. 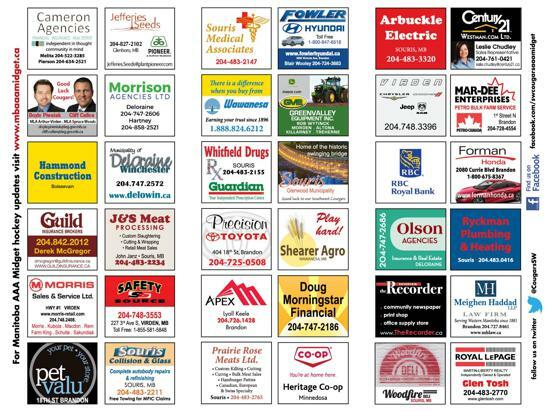 Please visit the office if you haven’t already purchased a square. Sunday afternoon the Central Plains Capitals pay a visit to Souris. The Capitals continue to earn points and are one of the top 4 teams in the league in the early going. Sunday afternoon the Central Plains Capitals will provide the opposition for the Cougars. The Caps come into the weekend with just 1 loss in five games. The Caps have to be one of the surprises in the early going as they battle for top spot in the 12 team league. The Cougars will see Grady Franklin and Tyler Weatherbie in the lineup as the Cougars back end sees Jay Webber on the sidelines with an upper body injury. A reminder the team is selling NHL drafts for $10 with the winner’s to split over $800 in prize money. The drafts will be available from any player or parent. Please support the team in this draft and then watch the results online once we have the draft loaded. The Cougars take part in the showcase weekend in Portage next weekend when all 12 teams will play a pair of games. The Cats play the Winnipeg Wild on Friday and then the Norman Northstars on Saturday. Thanks for participating in the Cougars Preseason.